It&apos;s a year of celebration with June 8, 2017 marking the 150th birthday of America&apos;s most famous architect, Frank Lloyd Wright. While you can always tour one of the many Frank Lloyd Wright masterpieces in Chicagoland, this summer the Frank Lloyd Wright Trust, in partnership with Wright sites across the country, is hosting a number of kid-centered events that make the master architect accessible to even little ones. Begin by downloading your very own Flat Frank to honor the legendary architect and inspire your kids to dream big and think boldly, like Frank Lloyd Wright. 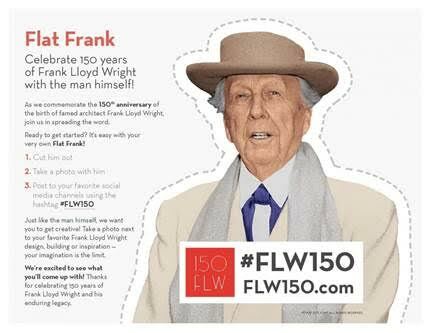 Cut him out and take a photo with him and post to your social media channels with the hashtag #FLW150. The downloadable Draw Your Own Plan activity sheet is a great way to prep kids for a visit to one of the architecture-focused birthday events. The weekly Pop Up Design Studio, hosted at the Robie House and the Frank Lloyd Wright Home and Studio every Friday in June, July, and August (9am to 12pm), gives kids the opportunity to explore and create in a series of fun, hands-on workshops. On the 3rd Saturday of every month, kids are invited to Wright&apos;s Prairie-style masterpiece, the Robie House, to design and build LEGO models that fit into a natural landscapes during Open Design Studio with LEGO®. Celebrate the 150th anniversary of Frank Lloyd Wright&apos;s birth by journeying with the Prairie Style Passport. 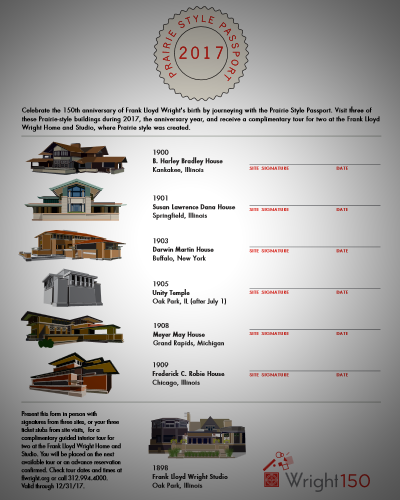 Visit three of these Prairie-style buildings during 2017, the anniversary year, and receive a complimentary tour for two at the Frank Lloyd Wright Home and Studio, where Prairie style was created. Valid through 12/31/2017. 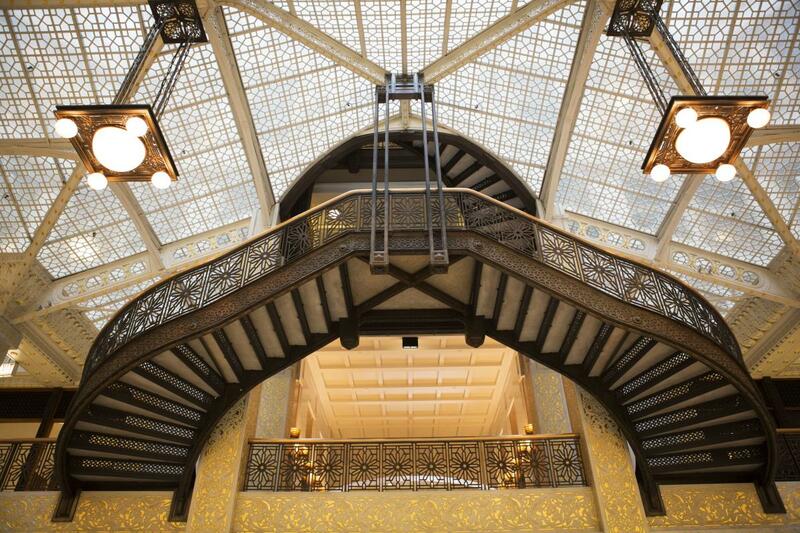 Take a Guided Tour of Wright&apos;s downtown Chicago masterpiece: In 1905, Wright was commissioned to remodel the Rookery light court and lobbies. He realized a stunning balance between Burnham & Root’s ornamental ironwork and his own vision to create a spectacular environment. Kids will love climbing the court&apos;s stunning staircase. See all events and learn more at flwright.org and share your family fun with @flwtrust.